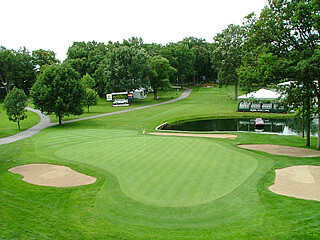 Welcome to our tournament page for the 2009 Buick Open played in Grand Blanc Michigan! The Buick Open has been around since 1958 with Detroit and nearby Flint Michigan both major manufacturing areas for Buick and the auto industry in it's heyday. The tournament took a hiatus from 1969 until 1978 and there has been a Buick Open held at Warwick Hills G.C. ever since. There have been some regional and notable former past champions of the Buick Open a list that includes the late great Tony Lema who was killed in a tragic plane crash shortly after his second win in a row at Warwick Hills in 1965. Julius Boros, Billy Casper, Mike Souchak, and Art Wall won some early Buick Open's. Fred Couples, Peter Jacobson, Wayne Levi, Ken Green, and and Chip Beck have won Buick Opens. More recently Vijay Singh (twice), and Tiger Woods (three times), with are notables who've won here more recently. And stay tuned for more inside the ropes stories, news, views from the 2009 and final Buick Open!